The compact Farmall C CVT drives likes a car — no shifting required. A simplified control pod guides the CVT transmission, and intuitive, easy-to-understand buttons on the pod allow you decide how your tractor operates. What’s more, the CVT gets the job done quietly and efficiently, so whatever you’re doing feels less like work and more like fun. A turbocharged, electronically-controlled 2.2L engine features 3 cylinders and a tunnel block design assures ruggedness and easy maintenance without sacrificing power, efficiency or performance. Two available models range from 45 to 53 HP (34-41 PTO HP). The latest fuel-injection technology offers several advantages, including faster throttle response, improved power performance, increased efficiency and cleaner emissions. The system precisely meters fuel as power demands for fast recovery to load, along with quieter engine operation with less vibration. The user-friendly CVT transmission provides smooth, seamless speed changes through varying conditions. It also makes the Compact Farmall C CVT one of the fastest roading compact tractors available, with speeds up to 20 miles per hour. Just press the single pedal and go. The CVT automatically adjusts to deliver the desired speed and match load conditions. Although CVT is an outstanding feature for all kinds of tasks, we didn’t forget those, such as loader work, that require frequent directional changes. A premium, finger-controlled shuttle shift lever lets you easily change direction. Just like driving a car or pickup, cruise control maintains a constant ground speed. This is a great feature for applications with a consistent load, such as mowing. Whether you prefer open air or a climate-controlled workspace, you can count on the deluxe features of the Compact Farmall C CVT series tractors. They create an environment where comfort and convenience fuel your productivity. Open Platform: A large, obstacle-free, step-through operator’s platform provides easy entry and exit and gives you plenty of room to maneuver. Noise Reduction: A thick rubber floor mat dampens noise and vibration. That helps reduce operator fatigue, helping you stay more productive all day. Deluxe Seat: A comfortable seat can help those long days seem just a bit shorter. A deluxe cloth seat with adjustable suspension, adjustable backrest, and available armrests let you personalize your experience for maximum comfort. Fully Adjustable Steering Wheel: The infinitely telescoping and tilting steering wheel lets you position it precisely for maximum comfort. Factory-installed Loader Joystick and Valve: Our loader control valve and joystick comes standard from the factory and is integrated into the right-hand console for easier operation and greater productivity. Toolbox: Conveniently store tools, hitch pins and other materials in a toolbox that’s easily accessible, yet tucked out of the way on the left side near the entry step. Seatback Storage Pocket: You’ll never leave the farmstead without your operator’s manual and other important documents with this convenient seatback storage space. Unobstructed Views: The large, obstacle-free operator’s platform provides excellent all-around visibility from the tractor seat, including rear visibility to the drawbar, PTO and 3-point hitch. The stylish, sloped hood on Farmall series tractors allows clear, forward sightlines to the front wheels, loader and other mid- and front-mount attachments. Instrumentation: The well-thought-out and designed control placement and instrumentation dash provides access without inhibiting visibility. Room to Move: Our comfortable, best-in-class cab offers the ultimate work environment. With loads of interior space, the open platform, along with left- and right-hand steps and wide-opening doors make for easy entry and exit from either side and give you plenty of room to maneuver. Climate Control: A comfort-creating HVAC system lets you customize your workspace. The rear window opens for fresh air circulation. 360-Degree Sight Lines: Large windows and well-designed structural support clear the way for 360-degree sightlines. A high-visibility roof panel keeps the loader bucket in sight. And an interior sunshade and multiple rearview mirrors improve visibility while reducing fatigue. Power Up: A 12-volt outlet powers electronics and other devices. Although the CVT and operator platform help make the tractor a breeze to drive, it’s how implements attach, function and power up that make it a versatile partner. You can count on Compact Farmall C CVT tractors for features, reliable ease of use and efficient productivity. Mid-mount PTO: To power mid- and front-mount equipment, such as mowers and snow blowers, a factory-installed mid-mount PTO comes standard. Speed Options: A rear, independent 540-RPM PTO with electro-hydraulic engagement is standard and drives all your 3-point-mount and pull-behind implements. The mid-mount PTO operates at 2,000 RPM. Flow Rate: An 9.7 gallons-per-minute hydraulic flow gives you the power you need for all kinds of heavy lifting, from loaders and backhoes to rear blades and rotary tillers. Remotes: All Compact Farmall C CVT series tractors arrive from the factory with two standard mid-mount valves for loader hook up. Add even greater flexibility with one or two rear remote options. Color-coding: Optional color-coded hydraulic levers and couplers simplify hookup. 3-point: Telescopic lower links and stabilizers make attaching and hooking up implements fast and easy. A single turnbuckle levels attachments. Mechanical positioning and an adjustable drop rate give you even greater control. 3-point Hitch Lift Capacities: Compact Farmall 45C CVT and 55C CVT: 2,800 lbs 24 inches behind the pin. Drawbar: A two-position drawbar lets you customize hitched implements or move the drawbar to keep it out of the way when not in use. With the ability to toggle between two- and four-wheel drive and multiple tire options, the Compact Farmall C CVT is always ready for the task at hand. All models feature a standard MFD front axle, providing four-wheel drive for improved traction and increased power to the ground. The CVT control pod lets you toggle between two- and four-wheel drive on the go as needed. All ROPS models include fenders and handles for easy entry and exit. Designed from the ground up for durability and simplicity, compact Farmall® C CVT tractors require minimal maintenance and feature easy, straightforward serviceability. That makes them a reliable choice for anyone — from a homeowner to a fleet operator. Regular maintenance points are accessible without removing shields or opening the hood. A ground-level fuel tank makes fueling easy. A 300-hour oil-change interval reduces downtime and maximizes uptime. 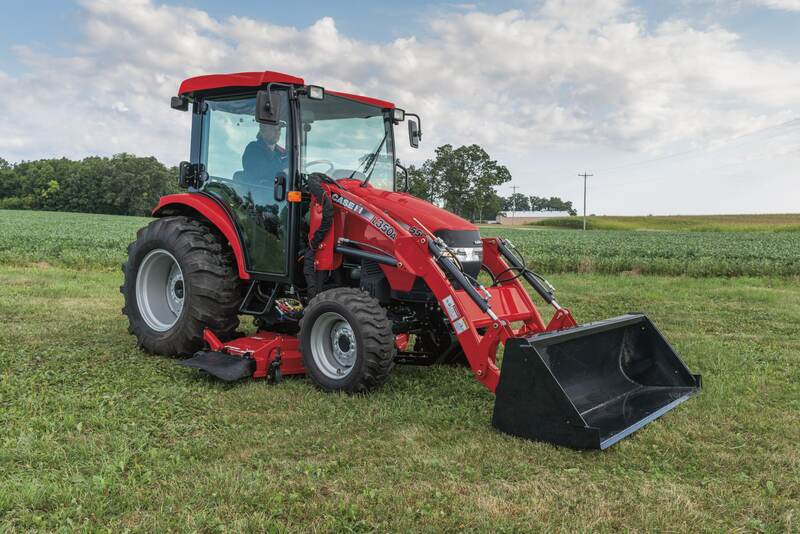 The Case IH L350A loader is designed specifically for use with your Compact Farmall C CVT tractor. L300A series loaders are built tough to take the twisting forces of serious loader work. Heavy-duty reinforcements provide greater strength, and large, rectangular, loader torque tube improve durability. All compact Farmall C CVT tractors come loader ready. The mounting brackets, joystick and controls, hydraulic valve and hoses and grill guard are already installed on the tractor. Just drive the tractor into the loader, put in the pins, attach the hydraulics and start working. 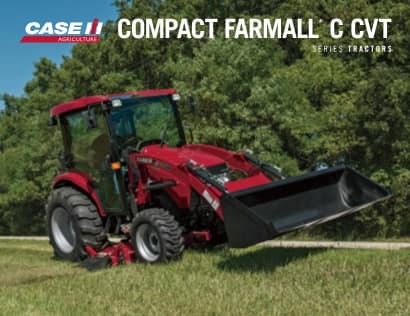 Your Case IH dealer offers a full line of attachments to help you get the most productivity from your Compact Farmall C CVT series tractor. Implements are quick and easy to hook up and include front-, mid- and rear-mount options, ranging from mowers and rotary tillers to blades and snow blowers to backhoes and rotary cutters. ​Compare our compact tractor specs to other manufacturers.